These ergonomic promotional pens have an hourglass form that lets your write comfortably. 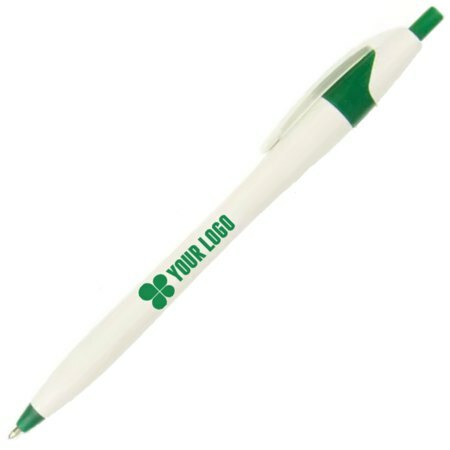 Also known as the Javelin Pen, it is one of the most popular plastic promotional pens around and a best seller. Each pen is a smooth writing medium ballpoint with black ink. It has an imprint area of 1.7" inches by 0.62" inches perfect for your logo. These pens come in an assortment of trim and imprinting colors - black, blue, green, red and purple. Match your custom imprint to the trim color or mix it up so your logo stands out. You can order them in quantities as low as 50 to as high as 1,500. You can order a single color pen or an assortment of colors. Printing turnaround time takes 4 business days, excluding shipping times that depend on your location.